The landscape of the Big Muddy Badlands in Southern Saskatchewan, Canada is adorned with buttes, cliffs and farming areas. The entire landscape becomes highlighted as the sky is aglow in various soft hues at sunset. 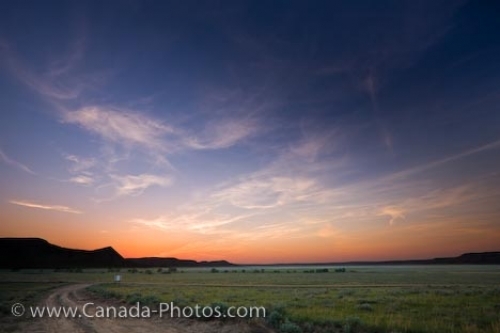 Thin wisps of clouds scatter themselves across the sunset colored sky over the acres of farmland in the Big Muddy Badlands in Southern Saskatchewan, Canada. The farming landscape around the Big Muddy Badlands is well known for its ranches and the use of the area by various outlaws, the Northwest Mounted Police, Indians and the early settlers. Farming was a very real way of life throughout the Badlands and many who grew up here, had their farms and landscape passed on through the family. Silhouetted in the backdrop, are the cliffs and buttes which surround the farms as another glorious prairie sunset decorates the endless miles of sky. Farmland in the Big Muddy Badlands at sunset, Southern Saskatchewan, Canada. Picture of a beautiful sunset across the miles of farming landscape in the Big Muddy Badlands in Southern Saskatchewan.